Spidescribe comes highly recommended as an intuitive and free mind mapping software where you can gather text, links, files, images and other elements. Complete with the ability to invite others to collaborate, plus you can retain ownership of the content (as of the copyright and content ownership terms accessed on the 27th Feb 2013 – note set your map as private). 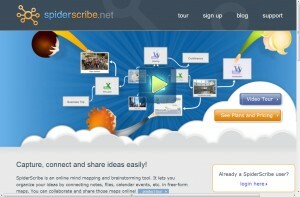 As Spiderscribe is an online tool, your work is available from any computer with internet access. All you need to get going is to sign up for a free account (this does have size limitations if you are thinking large scale). Go to: http://Spiderscribe.net for more information and to view a video tour.